Chai, H., Shen, Y. and Shi, H. (2017). Polyamine and Paraquat Transport Assays in Arabidopsis Seedling and Callus. Bio-protocol 7(15): e2421. DOI: 10.21769/BioProtoc.2421. Polyamines (PAs) are polycationic compounds found in all living organisms and play crucial roles in growth and survival. We here show the ‘Polyamine and paraquat (PQ) transport assay’ protocol, which can be used to examine the uptake activity of PA/PQ transporters. We have used this protocol to demonstrate that PUT3 in Arabidopsis is a polyamine transporter and is able to take up spermidine and its analog paraquat. PAs are involved in gene regulation by interacting with and modulating the functions of anionic macromolecules such as DNA, RNA and proteins. In living cells, PAs’ contents must be regulated to maintain the cellular hemostasis. In higher plants, three major polyamines, putrescine (Put), spermidine (Spd) and spermine (Spm), are present in either free form or conjugated forms with other molecules (Gill and Tuteja, 2010). In yeast, four plasma membrane polyamine transporters, DUR3, SAM3, GAP1 and AGP2 were identified (Uemura et al., 2007). In Arabidopsis, five putative polyamine uptake transporters (PUT1-PUT5) were identified and PUT1-3 have been experimentally validated as polyamine transporters (Mulangi et al., 2012; Li et al., 2013). Our protocol described below has successfully confirmed that PUT3 is an influx transporter for polyamines and paraquat, and PQ/Spd uptake is impaired in the put3 mutant (Shen et al., 2016). Put the Arabidopsis seeds in seed sterilization solution (see Recipes) for 15-20 min. Discard the sterilization solution and resuspend the seeds with sterilized ddH2O in a laminar flow hood. Let the seeds settle down and discard the solution. Repeat the washing step 5 times. Sow the surface-sterilized seeds in a row on callus induction medium (see Recipes) in a laminar flow hood, seal the Petri dishes with Parafilm and incubate the Petri dishes at 4 °C in the dark for 2 days. Place the Petri dishes in a horizontal position and let the seeds germinate and grow under 16 h light/8 h dark cycle (lighting provided by fluorescent bulbs giving an average light intensity of ~150 µmol/m2/sec) at 22 °C for 3 weeks. Transfer induced callus (Figure 1) to new callus induction medium in a laminar flow hood every 3 weeks until the transport assay (see Note 1). Figure 1. 3-week-old induced callus cells and 2-week-old Arabidopsis seedlings. Bars = 1 cm. Put the Arabidopsis seeds in seed sterilization solution for 15-20 min. Discard the sterilization solution and resuspend the seeds with sterilized ddH2O in a laminar flow hood. Let the seeds settle down and discard the solution. Repeat the washing step 5 times. Sow the surface-sterilized seeds in a row on ½ MS medium (see Recipes) in a laminar flow hood, seal the Petri dishes with Parafilm and incubate the Petri dishes at 4 °C in the dark for 2 days. Place the Petri dish in a vertical position and let the seeds germinate and grow under 16 h light/8 h dark cycle (lighting provided by fluorescent bulbs giving an average light intensity of ~150 µmol/m2/sec) at 22 °C for 2 weeks (Figure 1). Make a 50x and 500x dilution of 10 µl solution 2 (see Recipes) with ddH2O. In 1 ml of the ScintiVerseTM BD Cocktail, add 0 µl, 25 µl, 125 µl and 250 µl of 500x diluted solution to make 14C-labeled PQ solutions with 0 nCi, 0.1 nCi, 0.5 nCi, 1 nCi radioactivity, and add 125 µl and 250 µl of 50x diluted solution to make 14C-labeled PQ with 5 nCi and 10 nCi radioactivity, respectively. Measure the radioactivity by using Beckman LS-6500 scintillation counter to generate a standard curve for 14C-labeled PQ. Perform 3 sets of this test to ensure accuracy of the standard curve (Figure 2). Make a 100x dilution of 10 µl solution 3 (see Recipes) with ddH2O. In 1 ml of the ScintiVerseTM BD Cocktail, add 0 µl, 2.5 µl, 5 µl, 25 µl, 50 µl and 250 µl 100x diluted solution to make 3H-labeled Spd solutions with 0 nCi, 0.5 nCi, 1 nCi, 5 nCi, 10 nCi and 50 nCi radioactivity, respectively. Measure the radioactivity by using Beckman LS-6500 scintillation counter to generate a standard curve for 3H-labeled Spd. Transfer 100 mg fresh callus cells into a 1.5 ml Eppendorf centrifuge tube containing 950 µl liquid callus-inducing medium and vortex for 30 sec. Pre-treat samples at designed temperature for 30 min to reach equilibrium (Shen et al., 2016). Add 50 µl solution 2 (final PQ concentration at 10 µM), solution 3 (final Spd concentration at 2 µM) or solution 4 (final Spd concentration at 100 µM) (see Recipes) into the tubes according to the treatment conditions (see Note 2). Briefly vortex for mixing and return the tubes back to the designed temperature. Incubate for 1 h, gently invert each tube by hand every 15 min to resuspend the cells and ensure the equilibrium of PQ or Spd in the solution. Place tubes on ice immediately. Let the callus cells settle down and remove the PQ- or Spd-containing liquid callus inducing medium by using pipette. Wash callus cells five times on ice each with 1.5 ml pre-chilled liquid callus inducing medium. For each treatment, three replicate samples should be used at the same time. Transfer 20 seedlings of both wild type Col-0 and put3 mutant line with intact roots onto a filter paper saturated with 5 ml liquid ½ MS medium (see Recipes), and pre-incubate the seedlings at the designed temperature for 30 min (see Note 3). Mix 250 µl solution 2 (final PQ concentration at 10 µM), solution 5 (final Spd concentration at 2 µM) (see Recipes), or solution 6 (final Spd concentration at 100 µM) (see Recipes) with 4.75 ml ½ MS medium to reach the final concentrations. Saturate another piece of filter paper with the radioactive solution made in step C2b and pre-incubate it at the designed temperature for 30 min. Transfer pre-incubated seedlings in the step C2a one by one to the filter paper containing radioactive-labeled PQ or Spd and pre-incubate at the same temperature as stated in the step C2c. Carefully arrange the seedlings to make sure all roots are directly in contact with the filter paper. Incubate at designed temperature for 1 h.
Cut off roots of the seedlings from each treatment. Transfer the roots from each treatment into a 1.5 ml Eppendorf centrifuge tube. Wash the roots 5 times on ice by using 1.5 ml pre-chilled liquid ½ MS medium. For each treatment, three replicate samples should be used at the same time. Grind washed callus cells or seedling roots by using small blue pestle in 1 ml (for callus cells) or 500 µl (for seedling roots) crude protein extracting buffer (see Recipes) on ice until no clumps remain to release all intracellular contents. The solution should be homogenized to an even mixture that can be pipetted without clogs. Centrifuge the mixture at 15,500 x g for 20 min at 4 °C. Transfer supernatant into a new tube for radioactive and protein concentration measurements. Add 300 µl (for callus cells) or 100 µl (for seedling roots) of the supernatant of each sample into 1 ml ScintiVerseTM BD Cocktail solution. Measure the radioactivity of each sample by using Beckman LS-6500 scintillation counter. The radioactivity (nCi) of each sample was calculated based on the scintillation counter reading (CPM) and the equation of the corresponding standard curve. The total amount of transported PQ/Spd in each sample was then calculated based on the radioactivity and the used nCi per nmol in the transport assay solution. The total protein of each sample was calculated based on the protein concentration and the volume. The PQ/Spd transport rates were presented in the unit of µmole PQ/Spd per gram protein per hour (µmole g-1 h-1). The PQ/Spd transport rate at 0 °C of each sample was considered as non-specific binding of PQ/Spd, and therefore was subtracted from the PQ/Spd transport rates at 25 °C to calculate the adjusted and accurate PQ/Spd transport rates at normal condition. Readers are referred to Shen et al. (2016) for examples of data graphs. We maintained the callus cells by transferring fresh and fast-growing callus cells to a new callus induction medium every 3 weeks. By judging the color and growth of the callus cells, it is easy to select the callus cells for transfer. Fresh calli usually show light color whereas relative old calli show dark color. 2 µM Spd was designed to test if the transporter is a high-affinity PA transporter whereas 100 µM Spd was designed to test if other transporters are also working at high Spd concentrations. 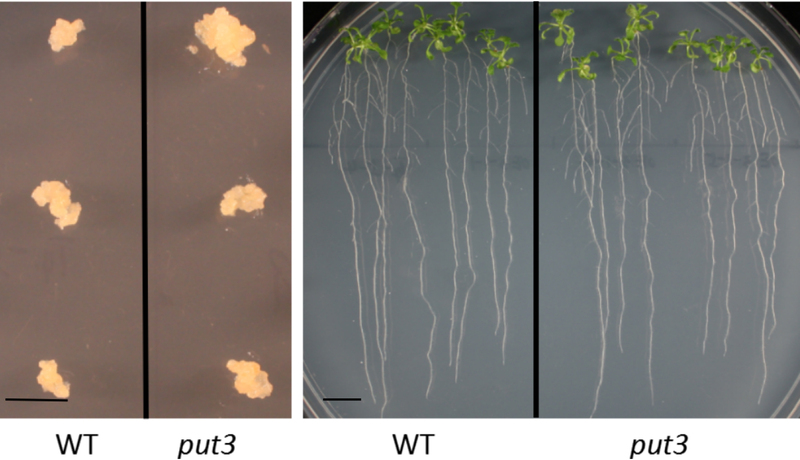 In our test, the callus cells and seedlings of the put3 mutant showed approximately 20-fold and 4-fold reduction, respectively, on 2 µM Spd uptake rate compared with the wild type. However, when a higher concentration (100 µM) of Spd was added into the medium, the transport rate was comparable in both put3 mutant and wild type. This might suggest that PUT3 protein is a high-affinity PA transporter and some low-affinity PA transporters may start to work at high PA concentrations. In the transport assay with seedlings, we used 150 x 15 mm Petri dish and put a filter paper fitting into the Petri dish. Seedlings were arranged relatively separate. This work was partly supported by the US Department of Agriculture National Research Initiative competitive grant 2007-35100-18378 to H.S. and by the National Natural Science Foundation of China (Grant # 31328004) to H.S. Gill, S. S. and Tuteja, N. (2010). Polyamines and abiotic stress tolerance in plants. Plant Signal Behav 5(1): 26-33. Li, J., Mu, J., Bai, J., Fu, F., Zou, T., An, F., Zhang, J., Jing, H., Wang, Q., Li, Z., Yang, S. and Zuo, J. (2013). Paraquat Resistant1, a Golgi-localized putative transporter protein, is involved in intracellular transport of paraquat. Plant Physiol 162(1): 470-483. Mulangi, V., Chibucos, M. C., Phuntumart, V. and Morris, P. F. (2012). Kinetic and phylogenetic analysis of plant polyamine uptake transporters. Planta 236(4): 1261-1273. Uemura, T., Kashiwagi, K. and Igarashi, K. (2007). Polyamine uptake by DUR3 and SAM3 in Saccharomyces cerevisiae. J Biol Chem 282(10): 7733-7741. How to cite: Chai, H., Shen, Y. and Shi, H. (2017). Polyamine and Paraquat Transport Assays in Arabidopsis Seedling and Callus. Bio-protocol 7(15): e2421. DOI: 10.21769/BioProtoc.2421.